Often, within conspiratorial circles, what is being focused upon by the “Pop” media is considered to be a distraction or subterfuge to “what the hell is really going on.” Those conspiracy theorists, who observe such phenomena through a synchronistic lens, tend to look for deeper, symbolic relevance in their scrutiny. Not satisfied with overt, political ramifications… as portrayed within pop media… the synchronistic theorist looks for covert, occult connections that may lead to a broader, deeper understanding of current events. A “trump” is a playing card which is elevated above its normal rank in “trick-taking” games. The word "trump" derives from "trionfi" or "triumph", the name of a card game dating back to the year 1529… which ultimately evolved into modern card games such as Whist. A trick-taking game is a card game in which the play of a "hand" centers on a series of rounds called tricks, which are scored to determine a winner or "taker" of that trick. The object or result of such games is closely tied to the number of tricks taken. Typically, with modern playing cards, an entire suit… such as “Clubs” or “Spades” is nominated as a trump suit. These cards then outrank all cards of plain (non-trump) suits. Within the context of our synchronistic examinations, it is exceedingly interesting to note that the word “Trionfo” was also the name of the original card game from which Tarot Cards were derived. In the Tarot Deck, the Major Arcana are a suit of twenty-two cards. They serve as a permanent trump suit within the tarot deck, and are distinguished from the four standard suits, collectively known as the Minor Arcana. The terms "Major" and "Minor Arcana" are used in the occult and divinatory applications of the deck. Again, within Trionofo, the tarot or major arcane cards had the role of what are now called trumps. Later card games would designate one of the four ordinary suits (clubs, diamonds, spades or hearts) thereby eliminating the use of Major Arcana cards in modern decks. So, within the modern playing card deck, the Major Arcana are gone… but not forgotten. As the presidential elections fall on the sixteenth year of the 21st century, let us take a synchronistic peek at the number 16. In numerology, the symbolism of number 16 indicates the achievement of the material power. According to numerologist, R. Allendy, it represents "the role of the Karma 6 in the cosmic unit 10. This role consists in creating a current of evolution (1 + 6 = 7) …but towards two opposite directions, so that, by itself, 16 (even number), is unable to choose." As a product of 2 x 8, it is the positive evolution leading to the karmic liberation, or the negative evolution leading to an increasingly tight sequence in the cycles of nature. A spiraling down, if you will. For the 14th century German mystic Jakob Boehme, this number represented "the Abyss", or the hell, as opposed to nirvana. According to the French author and lecturer on the paranormal, Guy Tarade, it is the number of Lucifer. Tellingly, the 16th trump or Major Arcana card of the Tarot deck is The Tower, which means the breaking down of old forms. Does the “Trump Tower” ring any bells? 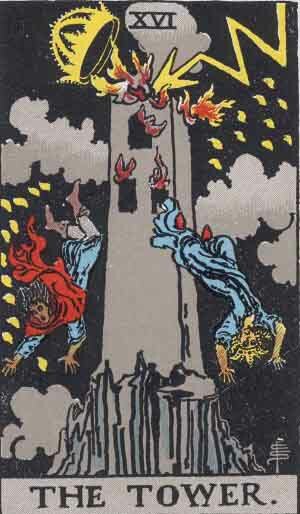 The Tower card follows immediately after The Devil card, in all Tarots that contain it… and is associated with sudden, disruptive, and potentially destructive change. The name Trump also raises more occult implications. The divinatory or oracular nature of the Tarot Deck, with its 22 major arcane or “trump” cards, suggests a supernatural predominance. 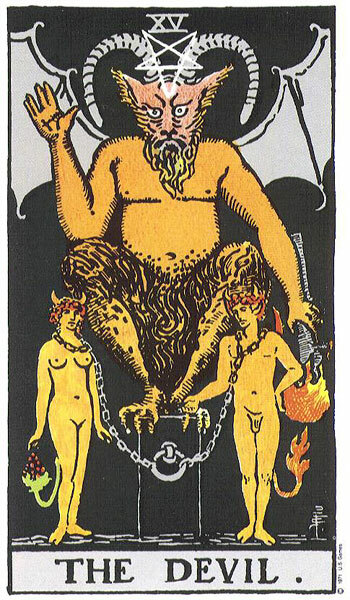 Pop Media, in turn would associate the Tarot with witchcraft and/or the “dark arts.” In light of the above, and returning to the concept of Cult of Personality, the rise in prominence of Donald Trump, suggests a troubling association with sudden, disruptive, and potentially destructive change. From a synchronistic standpoint, this imagery speaks in the archetypically rich language of Jung. It is clear that The Donald has struck a deep resonating chord within America’s collective unconscious. Trump’s persona and its popular appeal could be taken symbolically. In more mundane contexts, the term “trump card” can refer to any sort of action, authority, or policy which automatically prevails over all others. Trump may represent a “man of action” or worldly power. Worldly power often is wielded without regard for whom or what stands in its way. Like the Devil card, America’s infatuation with the persona or image of Trump, could ultimately be interpreted as a fascination with the shadow... or that which is unresolved within us. Again, in numerology, the symbolism of number 16 indicates the achievement of the material power… but towards two opposite, unresolved directions. In the wake of global humanitarian catastrophe, such as massive refugee crisis in Europe and the renewed and emboldened proxy wars between the US and Russia, now being fought in Syria, the Ukraine and elsewhere… the situation appears to be moving toward a Geo-political flashpoint. Meanwhile, all attention back in the good ole’ US of A, is being focused… directed… upon the ‘afore mentioned dog and pony show. So it is that the metaphorical or symbolic connotation of the name “Trump,” takes on a slightly more sinister significance. Is the GOP… or the powers that be, behind the “Grand Old Party” playing their trump card? Are they signaling… by hiding their intentions in plain sight… an intention, if not an outcome of the 2016 elections? Stay tunes intrepid explorers of the arcane… stay tuned.